January of this year marked the unveiling of Kornit Digital’s new flagship system, the Avalanche HD6. It launched major advancements for the direct-to-garment industry: increasing productivity, decreasing ink consumption, and the most refined hand-feel in the industry, without sacrificing color vibrancy or a higher price tag. How did this quantum leap across all textile printing occur? A panel of presenters from Hirsch Solutions, SanMar, and ColorGATE will join representatives from Kornit Digital to discuss the new HD technology, including its implications for apparel, system preference, color-matching, and production and quality. One of the key figures behind the DTG revolution at Fanatics is Tim Brule, VP of Disruptive Technologies, who brings more than 20 years of experience in garment production. Tim heads up process improvement for apparel manufacturing at Fanatics Branded. He has 22-years of experience in made-to-order (MTO) manufacturing, having co-founded FanBuzz, Inc., and DemandMade, Inc., where he created innovative software and processes to print, cut, sew, and press items ordered via e-commerce. Ryan joined Kornit in 2017 to lead North American marketing and strategic initiatives. He brings 20-years of B2B and B2C marketing expertise, most from the agency he founded, where he led blue-chips brands such as General Electric, Bayer, Toyota, IBM, Rockwell Automation, LG Electronics, and American Express. For screen printers integrating digital print systems, retail stores transforming to e-tail, or first-timers going straight to on-demand e-commerce, going digital doesn’t come without obstacles and challenges. Whether printing 20 or 2,000 garments per day, or a few yards to several hundred yards, you need to align vital components, or risk falling prey to the changing marketplace. Going digital is more than a trend; it is the new normal. In this presentation, printers spanning small, independently-owned and operated shops to international Direct-to-Garment and Direct-to-Fabric manufacturers will share their real-life experiences and lessons of launching into digital printing. Each speaker will share a unique issue they faced, where they went wrong, how it impacted their business, and how they managed to survive and thrive with digital printing capabilities. You’ll learn the facts, myths, advantages, and pitfalls to avoid in this informative webinar. Going digital need not be a gamble for your print operation. Register today and equip yourself with the knowledge and experience to grow your business with confidence. 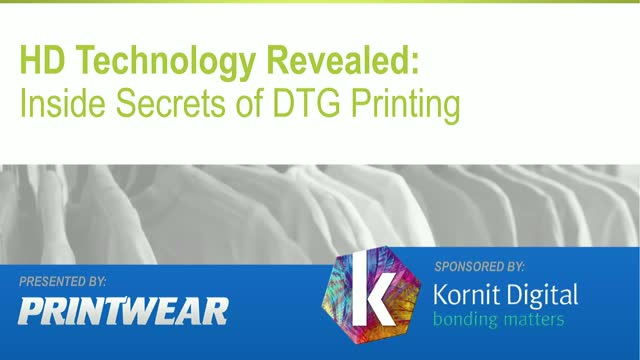 This DTG (Direct-to-Garment) printing webcast offers a valuable overview of the entire decorating process: what you can print, what you can’t print, and what equipment you need to be successful. It also includes lots of insider “best practices” from one of the leading experts on DTG, Terry Combs of Equipment Zone. There will be time during the presentation and at the end to help cover any questions you may have about the technology. If you are looking to get into the DTG market, or add DTG to your existing business, this is a must-attend webcast. The NBM Webinar Channel presents timely, informative and highly valuable webcasts for professionals in the commercial graphics and automotive markets. Our webinars are presented by leading industry authorities and cover topics relating to apparel decorating; awards and recognition; custom gifts; digital printing; engraving; promotional apparel; sign making; sublimation; vehicle wraps; automotive accessories and performance; the RV dealer and aftermarket, and other high-demand subjects.